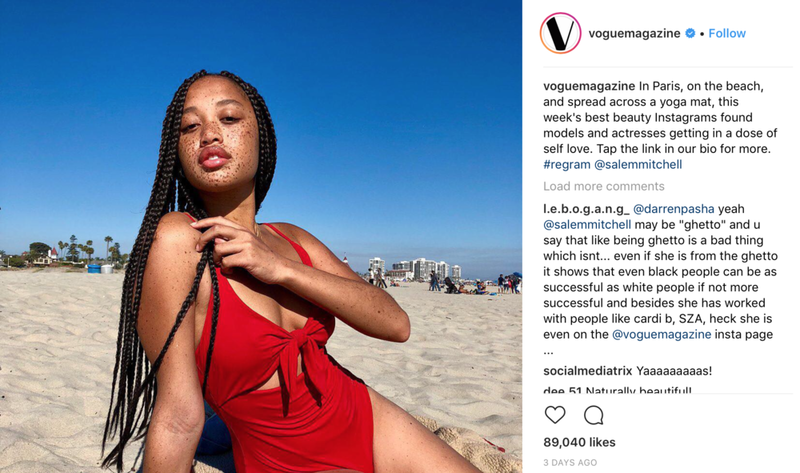 ON JULY 9TH, 2018, VOGUE POSTED ON INSTAGRAM A PICTURE OF MODEL SALEM MITCHELL RELAXING ON THE BEACH IN A RED ONE PIECE. WHILE THE IMAGE'S COMMENTS WERE MOSTLY POSITIVE, ONE NEGATIVE COMMENT CAUGHT EVEN THE MODEL'S EYE. THE COMMENT INCLUDED CALLING THE MODEL "GHETTO." In the past, Salem Mitchell has been known to embrace and set her own definition of beauty and has shared her personal experiences through social media. The model addressed the commenter head on by placing their comment on her Instagram story and responding with, "Everything about what I look like is considered 'trendy' in the media and in fashion right now. The freckles, the braids, the big lips, etc. But on a black woman it's ghetto for NO reason and we're tired of it." Mitchell went on to say that this was not her first experience with harmful comments, but she avoids fighting each one unless it serves a purpose to more than one person. This comment, Mitchell explained affected more than just her, so with sharing it, she expressed how it would help others understand the harm of the comment and the effect of cultural appropriation. In a interview with Teen Vogue, Mitchell shared, "Cultural appropriation is an important topic because black and brown people are constantly demonized for their appearance, their hair, the way they dress, their use of slang, and other characteristics when in reality everything that we’re doing has set a blueprint for the culture we see today." The beauty standard is forever evolving, and it takes leaders like Mitchell to shed light on the way comments are harmful to not only the person posting, but others who read those comments and have similar experiences. On Twitter, Mitchell wrote, "It's just crazy to me because it's little things like that that are so rude to me. For black women no one considers who we are as people, what we’ve accomplished, how we carry ourselves. My appearance classifies me as ghetto when the features I possess are glorified and praised on white women." This is a harsh, but honest truth that plagues more than just the fashion community. Hopefully with more outspoken models and leaders like Mitchell, we can see more people become inspired to speak up and start a conversation based on respect and learning, instead of ignorance and hate.